–Slom Meet & Greet. Lone Ranger draws sixty+, many new supporters. Party sends Saiki, Marumoto, fish out of water with conservatives & libertarians. Marumoto inappropriately accosts me “Tell HIRA to quit attacking me. I am trying to help all Republicans.” Wah, wah. Uh, Barb, this is a Slom event. You don’t do enough to warrant HIRA attacks. However, HIRA could tell how you voted to approve Rohlfing’s theft of funds to sue conservatives; or, how you are recruiting candidates to run against conservative candidates; how you too are culpable in the HQ apathy, incompetence, and dishonesty. Can’t reason with her delusional “trying to help all Republicans.” Slom is the only legislator who refuses to take money during session. Disclaimer: I ran his last couple campaigns; Treasurer this go around with a super new campaign manager. -First Four states winnowed the field (more like they ran out of money). Iowa Caucus. Cruz wins, Trump, Rubio. Bush loses. The bottom of the pack drops out. New Hampshire Primary. Trump wins big, Kasich, Cruz. Rubio loses. More bottom drops off. South Carolina Primary. Trump wins way big, Rubio and Cruz tie, Bush drops out. Nevada Caucus. Trump wins big. Rubio second, Cruz close third. Need eight states for nomination: score is Trump 1, Cruz 0, Rubio 0. -AZ chair did HRP training because HQ doesn’t have anyone qualified to do so. Embarrassing having a guest explain what a party should do, while Rohlfing smiles cluelessly and everyone else wonders why HRP doesn’t do any of it. Invited ALL candidates, district chairs and their teams – 20-22 attend (including ‘rent-a-crowd’ people), with only 5-6 campaigns represented ….. nine months to election. AZ Graham wants to be next RNC chair. –Platform meeting. 20 participants, from 11 districts (21% of the state), dropping by a quarter each meeting. They’ll blame another two years of a nonexistent platform on beginning too late, a small-time vision, and a lack of participation. In reality, they are afraid to present real solutions to Hawaii’s many problems because “the democrats may criticize us.” They insist on keeping a say nothing, neutral LLIFE, hiding policy statements in a secret electronic vault. (Suggest: staple together all of HIRA’s eblast and label it “Platform.”) Have you heard ANY discussion, much less proposals, for YOUR party platform, or are you waiting to be surprised at convention? – just the way HQ’s and Moses(he) wants it. Committee guidance “CONFIDENTIALITY. All matters discussed at official meetings of any body of the Party are presumed to be kept in confidence and, except as exhibited in the minutes for distribution, or by a spokesperson specifically authorized by the body to communicate specific matters, not to be disclosed to anyone who is not an actual member or authorized guest of the body or its supervisory bodies.“ Imagine Phyliss Schafly, or Tony Perkins NOT speaking out during national platform deliberations if someone introduced a pro choice plank. Can you imagine the RNC being so idiotic as to prohibit any member from speaking out? Another reason the party, the state cmte, and our legislators are an embarrassment. -HRP FEC www.fec.gov January in the Black(! ), with two frightening messages. Message 1: With ads, phone calls and email telling of great LDD sales, with local candidates laundering contributions to buy themselves a table, with two Presidential campaigns wasting $5,000 each for Hawaii ballot access, HRP nets only $13.3k. New compliance company uses different reporting figures to make it harder to decipher. Receipts $28,305 = 13335 contributions + 4524 from state account + 750 RNC for charity states + 2×5000 Cruz, Kasich. Sustaining Donors on record: 0/14 Exec Cmte, 1/51 District chairs, 1 member. When leaders don’t buy in, don’t expect others to do so. Disbursements $14,975 = $826 Tagavilla salary and Simon 1099 salary+608 unemployment tax+354 insurance, 1476 mortgage, second large 2875 IMS farewell plus 1887 for the new company, 253 phone, 130 mailchimp, 350 campaign software, LDD Kapena 650 & advertising 500 & printing 500, 2600 Presidential caucus facilities and 250 Walden travel and lodging. Zero election expenditures. Scary message #2: Unpaid bills of about $6k include Saiki’s HQ printer, health insurance, building maintenance fee, half month salary due next month. CoH for operations is 22.3k and CSC 5k soft money (may be more from LD)+7k counties. Also, 38.5k mortgage account (+4k in CSC) for 103k remaining mortgage. 8 of 13 months this CY and 10/15 months this election cycle in the RED. HRP election cycle in the RED $9.5k, using ’14 RNC funds Saiki (ACU 50%) did NOT use to elect Republicans. HRP red 23/37 past reports. Nine Rohlfing months: including 4x5k Presidential campaigns, CC event, R/H/L for a total shortfall of 20k. HRP red 5/9 months since Hellreich crowned Rohlfing. -Not everyone is failing. RNC raises $9.2M in January. -With donors wary following Hellreich’s Martinez fundraiser Bait and Switch, HQ pressures candidates to purchase LDD tables. January’s TOTAL contributions of $17k do not bode well for LDD’s 130k goal. Reader “Elected officials have been strong-armed to buy expensive seats to events using their campaign donations. So people that donated to candidates to help their election are being scammed because $$ meant for candidates end up in HRP pockets. Too bad our legislators don’t have more gumption to stand up to Hellreich and Saiki.“ In 2015, McDermott gave more of your donations to the party (1800) than he raised in the entire second half of the year (1400). Using big chucks of their donors’ funds, candidates moved money to HRP: 2500 each Aiona & Tagavilla, 1500 each McDermott, Ward, Agustin, E Ching, Federation of Republican Women. Competing for NCM, Liu and Jones used personal $2500. For NCW, Hellreich sponsored 0 while Smart accounts for 2500 personal and the 1500 from NFRW. Proof of where donations go Lincoln laundry part 1 and Lincoln laundry part 2 with a list of legislators who use your donations for free food and tickets for party events. “Despite their ultra-specific promises that Lincoln Dinner ticket purchases and related donations will help candidates get voters registered, educate the public, and win elections, none of that is happening.“ Walker shows how inept HRP is compared to everywhere else Walker vs Unions. HIRA’s Lee to HPR – ‘We need a conservative party, not liberal wannabees.’ Hawaii Public Radio embarrasses LDD. County communications from Rohlfing-appointed chair Fale(he) (ACU 50%). Fale fired. Temp replacement is Manutai who is, from a district chair “nice, but lost.“ and not communicating. Rohlfing/Marumoto SAY they have six non-incumbent candidates, 0 NI, for 64 legislative plus dozens of county seats. States defund Planned Parenthood. Eight plus Ohio, Wisconsin. PP kills babies Video 11, PP Sells Babies Heads. The ideology-challenged HRP STILL not weighed-in. Months since Hellreich wrote “the need to use massive voter registration drives to Increase our chances of winning.” Four since she again said “We need voter registration drives.” January 2016 RNC Political Director “We HAVE to do voter registration.” Still not in Hawaii. Months since the ’12 required HRP financial audit was to be conducted. 26 since the ’13 audit was due. 15 since HRP chair promised. Donors don’t give when finances are in question. Days (as of March 1) to the Presidential election. HRP is unable to challenge Democrats’ and liberals’ ideology until we solve our internal and administrative issues. We need a conservative, competent, organized, manned, and funded HRP with committed leaders. Republicans must first fix their house. –THE–MOST-DANGEROUS-MONTHS–IN-HAWAII “are from January to May. That’s when state representatives and senators are “in session” at the State Capitol.“ ACU 2015 Ratings proves why House Rs are Ds. HIRA says they’re RINOs: Out of 100: Fukumoto 36, Cheape 9, Thielen 27, Ward 45, Tupola 45, Pouha 18, McDermott 55. Average house Rs = 34!! This is why none are credible, and easily called NOT republicans. -HIRA alerts you to legislation, provides info to testify at state and county level, and provides you relevant background info. HRP doesn’t. HRP won’t advocate, nor even tell which bills are being heard. Half way through session, HRP has not submitted ANY testimony on ANY piece of legislation. Nadah. -Join Hawaii Rifle Association to protect our gun (civil) rights. HRA’s Legislative Spread Sheet. NRA BoD election Lee Running for NRA Board, www.willeslee.com. Please vote. 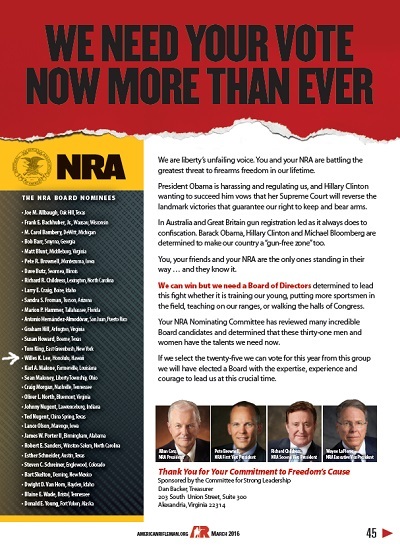 List of NRA Nominating Committee candidates. –Tupola got punked: she signed the letter opposing me, the next day her ‘friends’ booted her as floor leader. McDermott orchestrated the hit piece, writing that he and his caucus couldn’t and wouldn’t work with me were I “appointed” (he is not aware it is a national election) an NRA director. That’s not the Director’s job but, it raises another reason you can’t trust McDermott or your caucus: the only email McDermott sent me about this legislative session came this week … about gun legislation. “In a message dated 2/26/2016 9:23:56 P.M. Hawaiian Standard Time, bob@unleashedtechnologies.tv writes: A slew of bad gun bills the past 2 days…never seen anything like it.” Pretty much makes the “can’t and won’t” a lie.